Every April 23rd, the streets of my city, Barcelona, fill with red roses and book stands, for a celebration steeped in history. Have you heard about Sant Jordi Day? It’s one of the most beautiful festivals in Catalonia and the most romantic. Brits may already know Sant Jordi as St. George, the patron saint of both Catalonia and England. 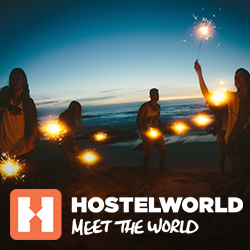 I’m Mariona, a Hostelworld Insider and I’m going to share my tips, so you can enjoy this Catalan celebration, like a local. What is Sant Jordi day all about? In the 15th century Sant Jordi (St George) became the patron saint of Catalonia, and rose markets started to appear all over the region every year on the 23rd of April, representing the rose that Sant Jordi gave to the Princess after slaying the dragon. Since then, it’s become tradition in Catalonia that on this day boys and men should give a rose to the women they love. This includes their wives, girlfriends or crushes, but also their teachers, sisters, grandmothers and mums… trust me, you wouldn’t want to be the guy who didn’t give a rose to his mum! Eventually these fairs started to fill with book stands to commemorate the legend of Sant Jordi, and it became tradition for women to give men books on this day. This is how, through flowers and books, Sant Jordi Day became the most romantic day in Catalonia. Who needs Valentine’s Day anyway? In medieval times, in a faraway land, there lived a town constantly threatened by a terrifying dragon. The people of the village grew tired of having their houses burnt and their families eaten, so asked their King for a solution. The King made a pact with the Dragon and fed him a farm animal every day in exchange for leaving the village alone. But, one day there were no more animals left in the village, so the King had to think of a different solution. From that day forward, they would draw names to decide which person would be sacrificed to save the rest of the village. The result of the first draw was a surprise to everyone – the name of the Princess was read out! The King tried to draw again, claiming it was a mistake, but the Princess accepted her fate and stepped forward to sacrifice herself. As the Princess stood in front of the Dragon, a brave Knight who was passing by (AKA Sant Jordi) noticed the unusual scene, ran towards the dragon and killed it with his sword. From the blood of the dragon grew a rose bush, and the Knight cut a flower and presented it to the Princess. As thanks for saving his village and his daughter, the King gave the Knight the Princess’s hand in marriage and they all lived together, happily ever after. As you’ve probably already noticed, the story of Sant Jordi is centuries old and needs to be updated. It’s been re-imagined by some amazing female authors with a feminist twist, like this one from Elisenda Pascual that includes a music-loving Dragon, a philosopher Knight and an un-ladylike Princess. Other versions feature a female Knight, a romance between the Dragon and the Princess, and a relationship between the Dragon and the Knight. Which of these fabulous combos is your favourite? And who says books are only for boys? Even though traditionally girls used to get flowers, nowadays they also receive books from their partners – or get them themselves. So, if you happen to have a girlfriend, a mum or a sister who you want to get a Sant Jordi present, books are a fantastic choice. Do the world a favour and try to buy local roses from local farms. You’ll be able to identify them because the flower is wider and more open. If you have any doubts, ask the seller and they’ll be able to help you out. I’m a big fan of going paperless and carry my kindle everywhere, but getting a paper book on Sant Jordi Day is part of the magic of this festivity. A great option is to go for second hand books – you’ll find many stands selling them! Usually they’re much cheaper and you can always find hidden gems. To celebrate Sant Jordi like medieval royalty, you should visit Montblanc. Its well-preserved medieval heritage makes you feel as though you’re stepping back in time, plus during the week that Sant Jordi Day takes place there’s a Medieval Festival that dresses up the whole village with flags, weapons and all kinds of curious things. If you visit Montblanc on Sant Jordi Day, you’ll also be able to see a performance showing Sant Jordi giving a rose to the Princess, which includes a lively medieval dance show. How to get from Barcelona to Montblanc? You can either take the train (ask for the lines R13 and R14 in the main stations) or rent a private vehicle. The train journey costs about €10 each way and takes around two and a half hours. In Puigverd de Lleida there’s another medieval festival around Sant Jordi Day. After a day full of activities, which includes dancing giants and popular music, there’s an outdoor theatre representation of the Sant Jordi legend. You might not understand what they say, but the costumes and the atmosphere will make up for it. And if I haven’t convinced you yet, I bet I will now: after the theatre there’s a very cheap dinner made with a delicious Catalan sausage called “butifarra”. The meal includes a drink and bread and costs €10. How to get from Barcelona to Puigvert de Lleida? Even though there are trains from Barcelona, they aren’t too regular, so I’d recommend teaming up with some hostel friends and organising a road trip. Obviously, the ultra-famous celebration in Barcelona couldn’t be left off my list. The city is beautifully decorated with roses on every corner and fairs selling every sort of book you can imagine. The only downside is that it tends to be very crowded, which is part of the charm of the city – or at least this is what I tell myself every year to deal with the lack of personal space. Apparently Gaudí was a big lover of this celebration, as he dedicated a whole building to it. The architecture of Casa Batlló was inspired by the legend of Sant Jordi, especially the roof, where scale-shaped tiles represent the back of the Dragon. This is why every year on Sant Jordi Day, Casa Batlló wakes up covered in bright red roses. Read about all the similarities between the Sant Jordi Legend and Casa Batlló here. Explore the different Barcelona neighbourhoods, not just La Rambla in city centre, as the festivities take place all over. I’d encourage you to walk towards the Ciutadella Park, Barceloneta and Gràcia to see the other faces of Sant Jordi Day. You might even catch a live performance! If you visit Barcelona during Sant Jordi Day, why not stay in a hostel named after the festival? Wait, what? Yep, there’s a hostel chain in Barcelona called Sant Jordi – this is how far our love for Sant Jordi Day goes! A party hostel in the Gothic Quarter, one of the most central and historical neighbourhoods in Barcelona. It’s perfect for solo travellers, since the hostel staff organise plenty of activities for the guests to get to meet each other. Created specifically for skate lovers, the vibe of this hostel is street style. Neon lights, old skateboards on the walls, graffiti art and even a little skatepark are some of the surprises waiting for you here. Oh, and of course an awesome atmosphere! This hostel is in the trendiest neighbourhood of Barcelona, Gràcia, and it shows. You can rent bikes to explore or participate in yoga lessons on the terrace. The staff and other travellers will make you feel at home and its super close to Casa Batlló, so you can explore Gaudí’s fairy-tale like masterpiece. A big thanks to @triophotographer for the the featured image, great shot!